As mentioned in Chapter 5, certain holidays deserve their own special attention, especially during winter. In fact, 94% of adults in the United States celebrate at least one winter holiday. As you prepare for upcoming celebrations, pay special attention to the way wine might fit into those celebrations. Regardless of your religious background, many winter celebrations are hard to pass up on. In fact, New Year’s Eve is one of the most celebrated holidays around the world and one of the oldest. It was first celebrated in Babylon 4,000 years ago. Because winter is a time of celebration, wine and spirits are frequently involved. During November, wine sales are at their highest, representing 37% of all beverage sales, as buyers prepare for winter holidays. But, as sales are advertised, and you start to shop for winter events, do you know where to start? 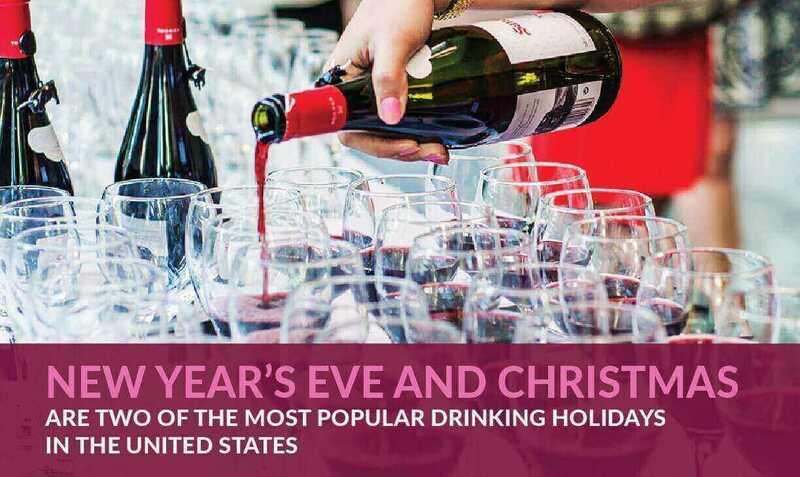 We’ll focus on two of the most celebrated holidays in the world: New Year’s Eve and Christmas. Take your enjoyment of each up a notch or two this year by focusing on special wine pairings as you plan and attend various parties. What Makes a Wine Better for the Winter? Our festive winter holidays not only lift our spirits, but they also add jubilation to the shortest days of the year. Christmas arrives four days after the winter solstice, with New Year’s Eve a few short days later — we need something to lift our spirits during the dark days. Wine is one of our most trusted go-tos. But how can one wine be suited for the winter, while others are suited for summertime? The answer is that a wine’s heartiness, viscosity, acidity and temperature all play into making it season-appropriate. One crucial factor to consider is how a wine pairs with food. When you think of winter foods, you probably imagine richer, heartier meals: stews, chili, pot roast, meaty soups, turkey, ham and similar mouth-watering dishes. Summer dishes, on the other hand, include lighter food like seafood and salads. The common factor among winter meals is the prevalence of meat and fat, which sticks with us as we make our way through chilly days. Thicker, heavier textures: Winter wines mimic the foods they complement. Options like cabernet sauvignon, zinfandel and even port wines make for delicious choices. They’re different from popular options chosen in the summertime when light, acidic wines prevail. Chardonnay and sauvignon blanc are more appropriately paired with lighter fare like salad and fruit. Warm serving style: There are some obvious exceptions — cue the cork popping on New Year’s Eve — but in general, we serve winter wines at room temperature. When you get into the world of mulled and spiced wines, you’ll find that some are even served warm, which is the perfect way to stay toasty on cold nights. Less fruitiness: In the summer, fruits abound. They make it into our salads and become our appetizers. In winter, however, we are more likely to see fruits in the form of jams or glazes. Winter wines reflect this change in that contain less acidity and fruit in their makeup. Thanksgiving dinner can be a challenging meal to pair wines with because of the huge variety of flavors in the meal itself. Turkey and mashed potatoes are heavy, which is contrasted by items like seafood casserole, vegetables and any other family food traditions thrown into the mix. It’s like trying to match one shirt with twenty pairs of pants. However, you can rise to the occasion. A great way around the complexity is to offer several different wines. Those going for rich food can pair with rich wine, and anyone who prefers lighter can choose accordingly. Start with something bubbly: Thanksgiving is a celebration of family and friends, and it’s great to have an appetizer wine for starters. A rosé pairs with most everything found in a Thanksgiving feast and is sure to please guests. Have a sparkling white wine ready: Of course you’ve already got bubbles, but a slightly heavier sparkling white can pair with certain dishes that a bubbly can’t. It also gives anyone with a taste for white wine a festive choice. Make a heavier red available as well: Malbecs, with their sumptuous, dark color and bold tannins, round off the wine list by pairing with those heavier items on the table. Their dryness makes them palatable with rich meals, and they’re also one of the most popular wines around — a safe choice for large groups. Put out a dry riesling for more pairing variety: Rieslings are aromatic, fruity and acidic, making them perfect for pairing with zestier and lighter Thanksgiving dishes. This wine is an extremely versatile choice that you will find has appeal among many dinner guests. It’s the acidity doing the heavy lifting here — the slight bite adds a sprinkle of excitement that many wine lovers will crave. Remember your dessert wine: You now have a good selection of dry and semi-sweet wines on the table. A sweet dessert wine wonderfully caps off a great meal. You can go for a lightly sweet wine like a chenin blanc or a Müller-Thurgau, but Thanksgiving might be the perfect occasion for a so-called “noble rot” wine. Though these beloved wines are sweetened by a spore rotting their grapes, the result is delicious and smacks of ginger and honey. Some examples include Sauternes, Tokaji and auslese. Christmas is a time for family, gathering around to celebrate old traditions, reminiscing and enjoying the happiness that can only come from being close to those you love most. Often, the holiday is accompanied by traditional food that may vary according to your heritage, heavy feasts, cookie baking — and eating, and special desserts that are only enjoyed during this time of year. Because of the overall specialness of the holiday, the wines you stock up on should be up to each occasion. They should provide satisfaction while complementing traditional dishes. At the same time, they should be versatile enough for all tastes to enjoy them. Malbec. Filled with earthy tones, Argentinian Malbecs are the perfect accompaniment to Christmas delicacies and traditions. Bordeaux blends. Made by combining Merlot and Cabernet Sauvignon, Bordeaux wines are keenly sought after around the world, especially around Christmas. Each winery uses different proportions, so actual flavor can vary greatly from one Bordeaux to another. If you’re not in love with the first Bordeaux you try, keep trying — your favorite is likely out there somewhere! It’s easy to enjoy white wine, even as the holiday season approaches. One that might be a surprising favorite is Falanghina. Wines made from this grape offer a freshness and balance with clean finishes, perfect for a variety of Christmas dishes and occasions. Another holiday-appropriate wine option might include a little extra spice. Spiced wines — either created by adding your own spices or purchased already spiced, are frequently served warm. The options for spiced wines are endless, meaning it’s easy to find something that fits most palates. Alta Vista Estate Malbec, Argentina, 2015. Chateau Blouin Bordeaux, France, 2014. Feudi San Gregorio Falanghina, Italy, 2015. Brotherhood Holiday Spiced Wine, New York, non-vintage. When you think of New Year’s, Champagne is probably one of the first things that comes to mind. It makes sense, 360 million glasses of sparkling wine are consumed on New Year’s Eve alone. Often, it feels like everything on television and pop culture promotes the idea that expensive is best, but is that always the case? Not necessarily. Consider the following ideas and pointers to find the best Champagne or Champagne alternative for your winter celebrations. First, think about the wines you enjoy most. Are they sweeter or dryer? Your taste in champagne will likely be similar. 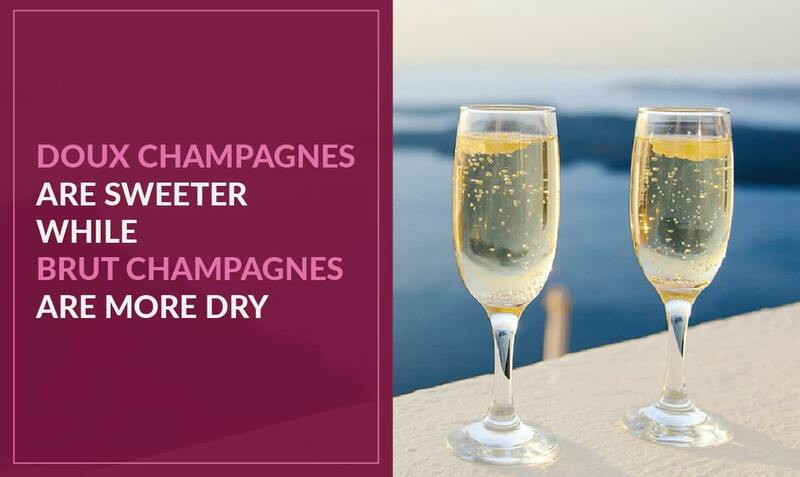 Doux champagnes are sweeter, while Brut champagnes are dry. If you dislike dry wines, you’re likely to love a brut, so stick with what you like — not which bottle has a label you recognize or a high price tag. Next, find the right grape. Champagne and champagne alternatives can be made from Chardonnay, Pinot Noir or Pinot Meunier. The traditional style, made in Champagne, France, includes all three grapes in a white blend. Champagnes, like sweet or sparkling wines, are less likely to include a vintage, as the date is less critical to the production of the drink. Remember, Champagne belongs to a specific region. Other alternatives that may be worth considering include Cava — the Spanish version of sparkling wine, and Prosecco — the Italian version. Each contains various grape combinations that may be more enjoyable than other traditional styles. Andre Brut Rose Champagne, non-vintage. Ayala Brut Majeur Champagne, non-vintage. Deutz Champagne Brut Classic, non-vintage. In the same way the smell of bacon can tempt the staunchest vegetarian, the irresistible aroma of spiced wine can convert even those who don’t have a palate for wine. In its odor is not only fruit and cinnamon but also an evocative image of coziness on a winter night. What’s more, spiced wine is one of the most fun concoctions to cook up — it absorbs practically everything you throw at it. Many people dream up their own spiced wine recipes and tweak them a bit each time. Pour a bottle or two of red wine into a cooking pot or crockpot. Which type of red wine is up to you, though full-bodied wines will handle the extra flavors better. Stick to dry wines, as you don’t want to make the drink too sweet. Bring it to a simmer. Add apple cider. This will bring necessary sweetness and fruity flavors to the spiced wine, as well as a late-autumn feel. Add two cups of cider per 750-milliliter bottle of wine. Put in cinnamon, cloves, honey, star anise and cardamom. These spices will make your house smell like heaven. You can add either cinnamon powder or sticks. Sticks of cinnamon can either be strained out or left in for visual appeal. Throw in some fruit. A good guideline to stick to here is making your spiced wine emulate a warm apple pie. Sliced apples are a great choice, as are slivers of oranges or mandarins. You can also add other fruits like berries. It would be difficult to add enough fruit to over-sweeten spiced wine. Consider adding packets of mulling spices. These packets are ready-made to add to your wine. In general, they’re a great option for flavoring the drink if you don’t feel like gathering all the needed spices yourself. You’ll still want to add fruit, though. Let the wine cook for an hour or so. It needs to cook on low heat, which will allow the wine to soak out flavor from the cinnamon sticks, star anise and other spices. Throw a ladle in it and serve it warm. The great thing about a crockpot is that it can go on the drink table instead of the stove, allowing you to keep your cooking space free. Additionally, the wine will stay warm until the last cup is gone. Watch people’s reactions as they smell the spices and fruits and ladle it into their cups — and don’t forget to grab a cup for yourself before it’s all gone. Christmas dinner consists of some staple dishes, which means it’s not too much of a challenge to plan for wines that will pair. But what about a Christmas party, where people are likely to be eating finger foods and chips? Chardonnay: This is a reliable go-to for parties due to its versatility and popularity. Depending on where you look, it is either the first or second most popular wine in the country — and it even pairs well with poultry and many other dishes. An added benefit of chardonnay is that you can usually grab it for under $20. Cold-weather whites: Plenty of white wines are perfect for cold weather. Chardonnay is one of them, but don’t be afraid to get a little more exploratory. A 2011 Louis Jadot Macon-Villages tastes incredible with chicken, fish and richer hors-d’oeuvres. Gewürztraminer is a German wine whose grapes are grown in cooler temperatures, though it’s also produced in areas of northern California and the Pacific Northwest. These wines will pique the interest of anyone wanting something a little different from chardonnay. Pinot noir: Pinot noir is about as popular as chardonnay — it will knock out a large chunk of different tastes in your party. Plus, much of the world’s pinot noir is grown in cold weather, and the spectrum of flavors available in it are compatible with winter wines. Cold-weather pinot noir is earthy and bold, and the fickle nature of the grapes leaves many surprises to be discovered. Port: Port falls into two main categories: tawny port and ruby port. Tawny port stays in the barrel a bit longer, and as a result has a nuttier, fruitier taste. Ruby port tastes more like the grapes’ natural flavors, with a tinge of tartness that pairs well with fruity desserts. Both types of port are sweet and offer an excellent dessert-wine choice. Madeira: The story of this wine is as interesting as the wine itself. As it’s barreled, the wine is exposed to warm, fresh air. The process emulates its early history of seafaring journeys, in which it was put on board a ship and taken to faraway destinations. The aging is part of the wine’s character. Madeira is full of notes of fruitiness, crisp toast and caramel, which give it the perfect bouquet of flavors for a cold evening. The aging process also bumps up the wine’s alcohol level to 20 percent, which many partygoers appreciate. Offering the perfect wine selection for a Christmas party doesn’t have to be stressful. A chardonnay and perhaps one other cold-weather white will satisfy those looking for white wines. Pinot noir, particularly of a more wintry variation, is sure to make red wine lovers happy. Finishing off the selection with a choice of dessert wines is the perfect touch to aid in celebrating the winter holidays. But now, without further ado, let’s look at some of the best mixed drinks you can create using winter wine. This hot chocolate is what it sounds like, and it’s every bit as good as you’re imagining. Choose a bottle of red wine with lots of fruit flavoring, and throw it in a crockpot on low heat. Throw in 400 grams of sugar and stir to mix and dissolve. Then, add 200 grams of cocoa powder, two cinnamon sticks, five star anise, and eight cloves. To truly create a rich chocolatey flavor, throw in 500 grams of semi-dark chocolate and stir until it has melted. Then, split up two clementines and add them in with a stem of rosemary. Heat the whole concoction for about 15 minutes. Let it sit for a few minutes before serving. Using a white for your mulled wine is a fantastic and delicious twist on the classic. It also has a slightly fancier air about it. Pour two bottles of white wine into a crockpot on low heat, then add half a liter of apple cider. Add 150 milliliters of elderberry cordial and the zest of two lemons. Then, throw in two cinnamon sticks, and split a vanilla pod to include. Finally, dissolve four tablespoons of caster sugar. Let the mix cook for 10 to 15 minutes before serving. When it’s cold outside, why not bring a bit of the tropics into your home? Start with equal parts red wine and apple cider — 360 milliliters of each. Add 160 milliliters of amber rum, two tablespoons of honey and half a teaspoon of cinnamon. Grind up another half-teaspoon of cloves and add them. Add three star anise, two tablespoons of dried chamomile and two tablespoons of valerian root. Your guests will love this taste of the Caribbean, and you’ll love the relaxing aroma it emits. To truly embrace the cold season, do it the way Scandinavians do it. You’ll start with two bottles of dry red wine. Add 240 milliliters of port wine, 240 milliliters of handmade orange juice and 120 milliliters of Cointreau. Then, throw in 175 grams of brown sugar and the zest of two oranges, along with 10 cloves, two cinnamon sticks and some raisins and almonds. Let the mix simmer until the cinnamon sticks have had time to soak. This curiously-named hot drink made a memorable cameo in Charles Dickens’ “A Christmas Carol,” in which the newly reformed Ebenezer Scrooge professes his desire for a bowl of it. Let’s find out how you can make your own batch. Pour 750 milliliters of red wine, preferably a fruity variety, into a crockpot with an equal amount of port. Add five oranges, 10 cloves, a lime and two lemons. Then, add a quarter-teaspoon each of allspice, cinnamon, ginger and mace, followed by a quarter-sized chunk of chopped ginger root. 150 grams of demerara sugar and several cinnamon sticks will add the perfect finish. Serve with nutmeg and a citrus fruit. Heating the spices for this drink in a pan before adding them to the wine can make the flavors more intense, so give it a try. Then, heat a 750-milliliter bottle of fruity red wine and pour it in, along with a quarter-cup of brandy and three cups of apple cider — the kind with no added sugar. Add a quarter-cup of honey, four cinnamon sticks, a vanilla bean cut in half, five star anise, a teaspoon full of cloves and another teaspoon of ground nutmeg. Add a sliced lemon and just one slice of lime, and enjoy the heartwarming resulting flavors. Now that you know how to make a wine cocktail, it’s time to venture into the world of the abstract. Why not use that wonderful winter wine to make even more exotic delicacies like syrup and jam? As it turns out, the mouth-watering mixture of spices and citrus is available in more forms than just wine. You can make syrup and jam right at home, too. Whether they’re for guests at a Christmas party or your family after Thanksgiving, everyone will be reaching for the jar. The full body and richness of winter wines are reminiscent of syrup. So why not go that extra step and make a delicious syrup from your winter wine? Start with your favorite spiced wine. 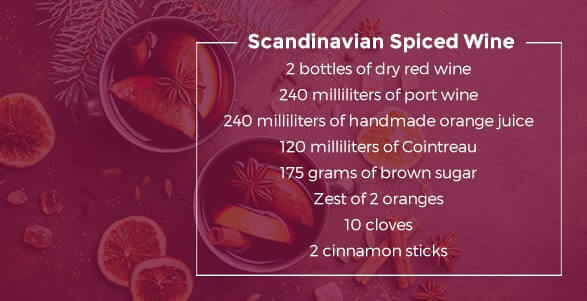 A good set of ingredients is a dry red wine, mulling spices, cinnamon sticks, a halved vanilla bean, some sugar and an orange. Instead of slow-cooking in a crockpot, bring the mix to a boil and wait until it bubbles down to roughly half its original volume. After letting the syrup cool overnight, put it through a strainer and set it aside for ice cream — it will be a delicious addition to your Christmas party. Why stop at syrup? Making jam out of mulled wine will bring the delicious, cinnamon-infused flavor of the drink to the bread-and-cheese table. Start by getting your canning jars, lids and a boiling water bath ready. Next, make a spiced wine out of ingredients like citrus fruit, bay leaves, nutmeg and peppercorns, leaving some of the sugar aside in a bowl. After straining the chunks out of the wine, stir in lemon juice and calcium water. Mix the rest of the sugar with pectin and mix these fully into the wine, bringing it to a full boil. When it reaches its boiling state, pour the jam into a jar with a bit of room at the top. Seal it and immerse it for 10 minutes in boiling water. Let it cool overnight and then enjoy on cheese, bread, ice cream and more. Contact Marketview Liquor if you’re looking for a wine selection so you can create the perfect holiday-party recipes. Introduction/Chapter 1: Getting Started: Red Wine? White Wine? Seasonal Wine? This entry was posted in Marketview News by marketviewblog. | Bookmark the permalink.